As a runner in the Pacific Northwest, you have probably heard of, if not participated in, the Hood To Coast Relay, running around 200 miles from Timberline Lodge to Seaside. The relay is an experience like no other, and whether you love it or not, the memories stick with you for a long time. Application date for 2019 has passed and acceptance (or not) letters were sent out in October, now you have several months of planning and anticipating ahead of you. 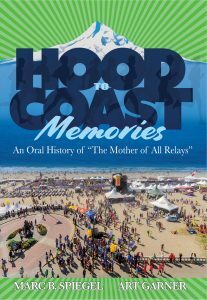 It is difficult to explain the experience to anybody who has not run a relay like this before, and the book “Hood to Coast Memories – An Oral History of The Mother of all Relays” is a great read for anybody from newbie to multi-year veteran. The book is entirely made up of stories from relay participants who were excited to share memories for the book. It starts with a history and rules of the race, and each of the 25 chapters has a brief introduction, and the stories are sorted by topics such as Night Running, Road Kills, and Bathroom Humor. Every contributor is introduced with a brief sentence about where they are from and their ties to the race. The stories range from informative and factual, to funny and heartwarming, to sad or “cringe-worthy.” Overall a very fun read, and if you’ve spent a day in a van with five others, you’ll be able to relate to several of the stories. Hood to Coast Memories features personal recollections from “The Mother of All Relays.” Runners, walkers, volunteers, event organizers, and others share their memories from the almost 200-mile relay race across Oregon from Mt. Hood to the Pacific Coast. The book captures the character and appeal of the race that began in 1982 with eight teams and has grown to more than 1,000 teams and over 12,000 competitors. It is 410 pages and includes over 250 stories about the race, as well as more than 20 pages of pictures. The book is not simply about the elite teams or the fast runners. It doesn’t focus solely on the early years of the race, or highlight only the relay’s recent history. Instead it features memories from the inaugural event and the early years, through the record-breaking and unique teams of the 1990s, into the 2000s, and all the way to today. This would be a great gift for the runner in your life who competed in the 2018 event, or maybe as something for a 2019 participant! You can purchase an autographed copy of the book directly on the Hood to Coast Memories website, or non-signed at Amazon ($25).